Don’t put away the Champagne quite yet. New Year’s celebrations are not over. Right around the corner is Setsubun a Japanese tradition celebrated on February 3rd. Setsubun, which means, “seasonal division” falls on the day before the beginning of each season. The Japanese celebrate the spring Setsubun as a symbolic (or second) New Year, with foods like soybeans, sardine heads and maki-zushi intended to cleanse the evil spirits from the past year and to keep the demons away from the new year. Customs surrounding this day apparently date from as early as the Ming Dynasty (1368-1644) in China, and in Japan they began to take form during the Muromachi Era (1392-1573). Though there are myriad ways to celebrate, the most common is mame maki, which translates as the “bean scattering” or “bean throwing.” Often, the mame maki is performed by the toshi otoko, the “year man”—a man born in the animal sign of the coming year—or the male head of the household. The toshi otoko will throw iri-mame (roasted soybeans) either outside the house or at someone costumed as an oni (evil spirit). It is thought the demons hate soybeans so their use purifies the house, driving away the oni who would otherwise bring misfortune and bad health. Prior to the beans being thrown, they are placed into a large bowl. Once dinner is over, everyone eats one bean for every year of their life. Some people eat one extra bean to ensure a year of happiness. If there are no soybeans handy, peanuts are sometimes used as a substitute. These small, home rituals have grown over the years into large, public events. Some Japanese temples throw roasted soybeans, some wrapped in gold or silver foil, as well as envelopes containing money, sweets, and other items. They may hire celebrities to help throw the items, and some major events are even televised. 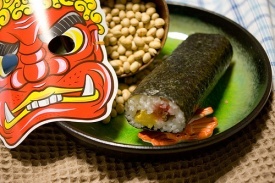 Another intriguing ritual for Setsubun involves eating uncut maki-zushi, called eho-maki (meaning: “lucky direction roll”), similar to a sushi roll that has not been sliced into pieces. The ritual requires that while you are eating, you face the eho, the lucky direction of the year, determined by the Chinese zodiac. You must eat the entire roll, about eight inches long, without a break and without speaking. If you succeed, you will have much luck, longevity, and good health in the coming year. There are competing stories about the origin of this custom. Some people say it started when a young Geisha ate a maki-zushi to ensure she would be with her favorite lover in the coming year. Others believe merchants in the late Edo and early Meiji eras ate this special maki-zushi at Setsubun hoping for a new year of prosperity. Another theory maintains that a samurai coincidentally ate maki-zushi at Setsubun the day before a battle and was victorious. In some areas, the eho-maki is made with a stuffing of seven colors that represent Shichi Fukujin, the seven gods of good luck and happiness. Usual ingredients include kampyo (dried gourd strips), shiitake mushrooms, eel, and egg. Additional components include oboro denbu (pink fish powder), cucumber, and koyadofu (dried tofu). Sometimes the roll is made with twelve ingredients, for added luck. Though the roll is commonly made with nori, sometimes a thin sheet of egg is used as a wrapper, and the egg sheet may be branded with a picture of an oni. A third ritual involves placing a hiiragi iwashi (meaning: a “holly sardine”) on the outside door. This is a cooked sardine head impaled on a holly branch, sometimes with a garlic clove or onion. The rest of the sardine will be have been eaten prior to the ritual. The branch is also supposed to keep evil away, just like bean scattering. It is thought oni hate the smell of sardines, and also worry about getting their eyes poked out by the sharp points on the holly leaves. What will you eat to ensure the demons do not plague you this New Year? 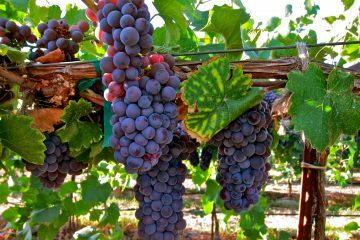 Richard Auffrey has been writing about food and wine for over four years. He currently authors The Passionate Foodie blog and also writes a weekly food/wine column for the Stoneham Sun newspaper. Though based in Massachusetts, Richard writes about everywhere that he travels and has a special affinity for Nihonshu, Japanese Sake.